In sports, everyone is a winner—some people just win better than others. Like the reporters working the Texas Rangers bankruptcy auction, who got quite a showdown last night between two of the biggest figures in Texas sports. Nolan Ryan and Chuck Greenberg have been trying to buy the Texas Rangers away from Tom Hicks ever since he announced that the team was bankrupt (running the Dallas Stars and Liverpool FC into the ground soon followed). Ryan and Greenberg were MLB's preferred pick and seemed like a lock: Nolan Ryan was Nolan Ryan and had connections to the team as both a player and a front office executive; Greenberg was the money behind the operation, a nice enough seeming fellow that had the "moxie to lead the [team] back to relevancy and into the playoffs." But it wasn't to be so simple. Hicks would agree to deals, but the lenders behind him would not. Eventually, an auction was deigned to be the answer. Like a community theater production, the auction became a comedy of errors; made all the better—or worse, depending—by the inclusion of Mark Cuban in the proceedings. As per Evan Grant of the Dallas Morning News—who liveblogged the whole thing—Cuban came into the courtroom, guns drawn, when it was announced that his group's bid was $25 million more than the Ryan-Greenberg group. This led to lawyers from both sides cursing at each other in the hallways. What followed was a prolonged to-and-fro between the sides as they continued upping their antes, Cuban's side pausing briefly to order in a few pizzas, giving out a slice to SBJ's Daniel Kaplan—likely a broken man by the end of the night. Just after midnight, the bids had gone into the high $500 millions and the strangest thing happened—Cuban stopped. He looked at the Ryan-Greenberg group's latest bid—$385 million in cash, $208 million in assumed debt, $12 million in escrow—and balked. 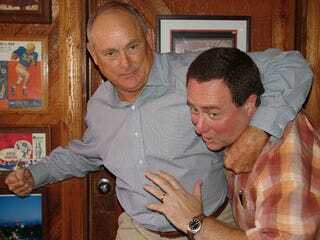 Seventeen years and one hour after Nolan Ryan put Robin Ventura in a headlock, he owned the damn team. Truly a night to remember for baseball and finance reporters in the state of Texas. But then the conspiracy theories started. Rob Iracane of Walk Off Walk pointed out this morning that the winning bid did not include any land around the stadium. The deal that the Ryan-Greenberg group originally reached was for $575 million, but $70 million of that was for land. This means that there is an extra $88 million going directly to Tom Hick's creditors—who can now pay Mickey Tettleton that money he's still mystifyingly owed. Randy Galloway of the Fort Worth Star-Telegram looked at the involvement of Cuban and the rising prices and just knew in his bones that Cuban had no real interest in the team and was only trying to drive up the price. Yes, Cubes was a lender to the club after buying up some of the debt. But that's just a sly move on his part. If he's one of the creditors as well as a bidder, he's guaranteed to either buy the team—his attempts to purchase an MLB team are well recorded—or recoup his expenses and live to try again in the future. How Randy Galloway twists this into a malicious move on Cuban's part, much less that he was working as the "lackey" of the shadowy creditors is beyond me. When asked for comment, Cuban told us "That's the stupidest thing I've ever heard," and right now, we believe it.